We're starting to move back to full slates of releases, as we distance ourselves from the Oscars. This also includes, if not the first attempted, the possible first blockbuster of the year. The first film designed to irritate scientists and creationists equally, 10,000 B.C. is the latest farcical epic from Ronald Emmerich, he of The Day After Tomorrow, Independence Day and Godzilla. 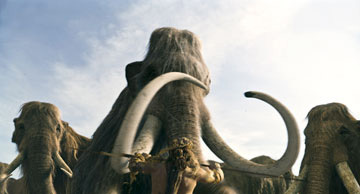 Although there's some hint of a story about prehistoric civilizations and Clan of the Cave Bear-esque anthropology, it's basically an excuse to stage anachronistic battle scenes (it wasn't called the stone age for no reason) and bring saber-toothed tigers and woolly mammoths to the screen. Starring a cast of unknowns (Cliff Curtis is about the only actor who has any kind of presence), the film used the money it saved on the cast to put it into spectacle, which I have to admit, seems to have been done pretty well. But we're still mostly left with a big budget version of Apocalypto, or The Scorpion King without the mystical elements. Hey, maybe that's exactly what you're looking for, far be it from me to judge, and I can still go rent Conan the Barbarian. Look for about $35 million from this in its debut weekend. Martin Lawrence is going to have two modest successes within the span of a month. Someone hold me. College Road Trip isn't exactly his film, per se, belonging instead to ex-Cosby Kid Raven-Symone, who's all grown up now, but it still counts for the purposes of scaring me. He plays her father, escorting her on a trip to visit a series of colleges around the country. Cause nothing says wild party times like overprotective fathers, am I right? Then again, it's a (G-rated) Disney film, so set your sights pretty low (incredibly, this was at one point in its lifetime a National Lampoon's production). Raven-Symone has a pretty sizable following from her TV show That's So Raven, and this is somewhat comparable to a Lizzie McGuire movie in terms of appeal, though with the wacky hijinks our classic college comedies such as Animal House, Real Genius, PCU or even How I Got Into College, dialed down to about a 1.5 out of 10 on the Blutarsky Scale. About the film's cleverest conceit is a phantom pig that only Lawrence sees and gets him into trouble. I know, you're rushing out to buy tickets already. Don't let me get in your way. In contrast to 10,000 B.C., this film lives and dies on the appeal of its stars, who do have the pull in specific demos. I see this opening to about $19 million, but dropping off pretty rapidly. In 1971, thieves in London made a daring and astounding robbery of a bank vault on Baker Street, making off with over £3 million in cash and jewels, still one of the biggest heists in British history. No arrests or recovery were ever made, and the details were sealed from the public for 30 years. The Bank Job, the third of this week's films, purports to tell that story. Jason Statham stars as the unlikely-named Terry Leather, a low-level scammer and car dealer who stumbles on the opportunity of a lifetime when an old neighborhood friend (Saffron Burrows) offers him the info on the potential for a score. The vault contains much more than cash, however, including damning secrets about the British mob, government and Royal Family.